Could it be the Lumia 530? The FCC has more than once proved a handy way to spot unannounced smartphones and the latest unidentified phone to pass through it is the Nokia RM-1018. 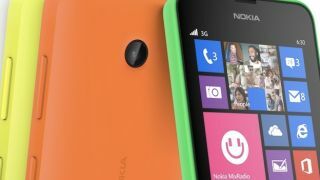 The listing was spotted by Phone Arena, which theorises that it could be the rumoured budget Lumia 530 based on the fact that said handset is thought to have a 4.3-inch display. The current incumbent at the bottom of Nokia's range - the Lumia 520 - has been around for a while and it's about time it got a refresh. The FCC listing doesn't actually mention a display size, but it does state that the dimensions are 62.3 x 119.7mm, which would be a good fit for a 4.3-inch screen. Other features revealed by the FCC include that it runs Windows Phone, has a microSD card slot, a removable battery, and supports Wi-Fi, 3G, Bluetooth and GPS. Windows Phone plus Nokia means this is definitely a Lumia, whether it's the Lumia 530 is more up in the air but it's the best guess right now. Will it be better value than the Lumia 630?